At 2:30pm Wednesday afternoon, the Atlanta Braves made it official as they traded outfielder Mallex Smith and relief pitcher Shae Simmons to the Seattle Mariners in exchange for left-handed pitching prospects Luiz Gohara and Thomas Burrows. Is trading away a prospect with outstanding speed, great on-base percentage, a sure-cut leadoff hitter and a one of a kind personality a bad thing?…I say no. 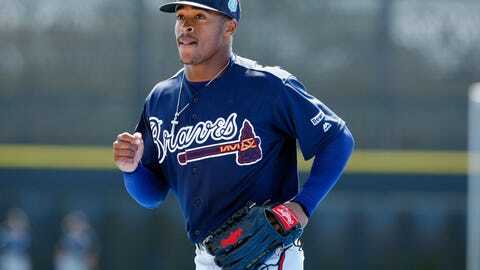 To be honest, I’m glad the Braves traded away Mallex Smith. Not because I didn’t want him in our organization or I thought he was awful at baseball, but because he was blocked, didn’t have a fit on our team, may have been shipped back to Gwinnett, or may have been on the bench not getting a lot of PT. The 23-year-old from Tallahassee, Florida was drafted by the San Diego Padres in the 5th round of the 2012 draft. The Braves acquired him on December 19, 2014 when they shipped Justin Upton and Aaron Northcraft to the Padres for Smith, Max Fried, Dustin Peterson, and Jace Peterson. I think we got the better of that deal, don’t you think? Especially on the Padres as he only spent a year in San Diego. After the Braves signed center fielder Ender Inciarte for a 5-year deal (6th year is an option) and they didn’t trade Nick Markakis or Matt Kemp (no telling if they were trying to) this offseason, Smith was left without a job now or in the future. Mallex and the Braves were about to enter an extremely uncomfortable situation in a few weeks. Do the Braves send him back down to Triple-A or do they stock a talented prospect on the bench? I think Atlanta was smart here and got two really talented pitchers in exchange. Take a look at Ben’s post about who Gohara and Burrows are. As I wrap up, let me be clear with my thoughts…I really enjoyed watching Mallex Smith play baseball and was hoping somehow he’d get another shot. But that shot just didn’t seem possible with the Braves. I’m glad he’s getting an opportunity to go to another organization who can use him. Seattle, wait nope, Tampa Bay should be a very good spot for Smith to grow. Right now, on the Rays depth chart page, they have Mallex slated in as the left fielder. The Rays also have Corey Dickerson (who will probably start in left), Kevin Kiermaier in center and Steven Souza Jr in right. One positive for the Rays and Smith is that they’re in the AL and will have a DH. Smith could be playing everyday in Tampa! What this move also does, is it eliminates two players from the Braves 40-man roster. The open bench position will definitely be looked at now. This could open the door even further for Mel Rojas Jr (my pick), Emilio Bonifacio (ugh…) or possibly a signing of the remaining free agents. Yes, Kelly Johnson and Jeff Francoeur are still looking for jobs. Guys like Luis Valbuena, Dustin Ackley, Nolan Reimond, Sam Fuld, Gregor Blanco (we all know the Braves like to reacquire old talent), Peter Bourjos, Chris Coghlan are also looking for work. Atlanta has a lot of options for their bullpen so adding another reliever to fill the Simmons void isn’t necessary. The Braves could sign two additional players. I think the Braves sign a 4th outfielder shortly as they now look a little slim in that position. We’ve got prospects on their way, but nothing ready if an injury occurs. I’m guessing the Braves sign a veteran outfielder and keep Rojas in Triple-A. If two injuries happen, Rojas gets a call. Now, we wait for the other shoe to drop.